* Sophia Hults - age 49, female, white, 1350 in real property, 210 in personal property, born in N.J.
* Ann S. Bail - age 5, female, white, born in N.J.
* Ann Auble - age 73, female, white, born in N.J.
1860 United States Federal Census, Sussex County, New Jersey, population schedule, Page 304, Dwelling #249, Family #260, Sophia Hults household; indexed database and digital image, Ancestry.com (http://www.ancestry.com), citing National Archives Microfilm Publication M653, Roll 709. 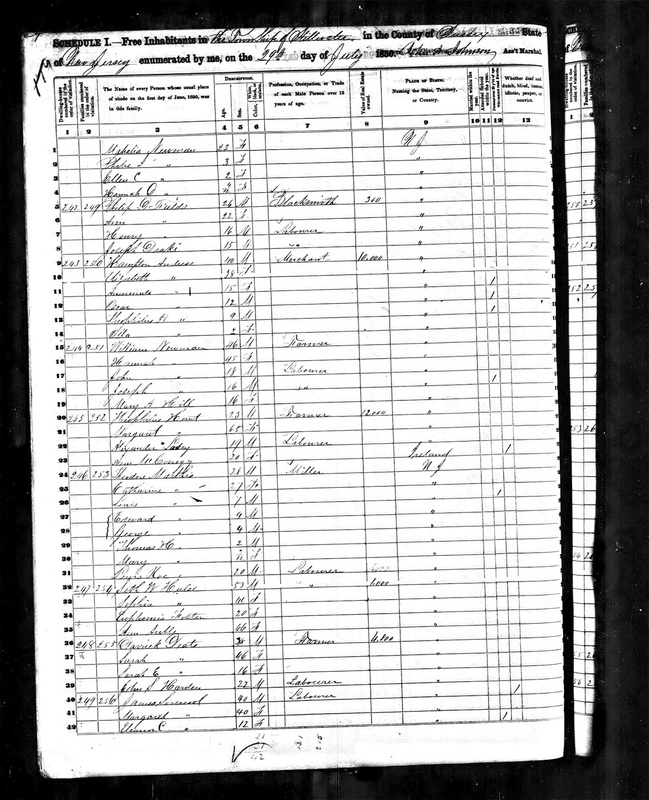 From previous research on the Auble family, I know that Ann (Row) Auble (1787-1860) married John Auble (1780-1831) in 1804, and had at least nine children. Their daughter, Sophia (Auble) (Foster) Hulse (1805-1887) was the eldest child, who married (1) Alley H. Foster (1805-1833) in about 1827, and (2) Seth W. Hulse (1797-1856) before 1850. Euphemia Foster (1828-1895) was the only child of Alley and Sophia. Euphemia had a daughter, Samantha Ann Bale (1855-????). 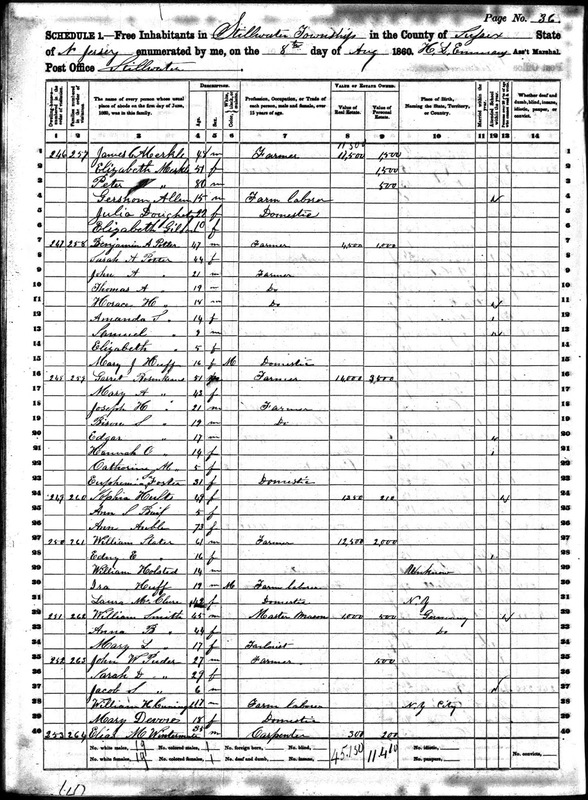 In the census record above, Sophia "Hults" is Sophia (Auble) (Foster) Hulse, and Ann S. Bail is Samantha Ann Bale. Ann Auble is the mother of Sophia Hults, and the great-grandmother of Ann S. Bail. 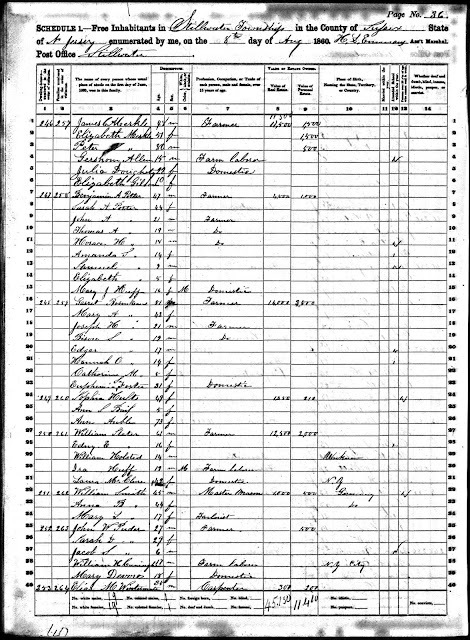 John and Ann (Row) Auble are my third great-grandparents. I am descended through their son, David Auble (1817-1894), who married Sarah G. Knapp (1818-1904).